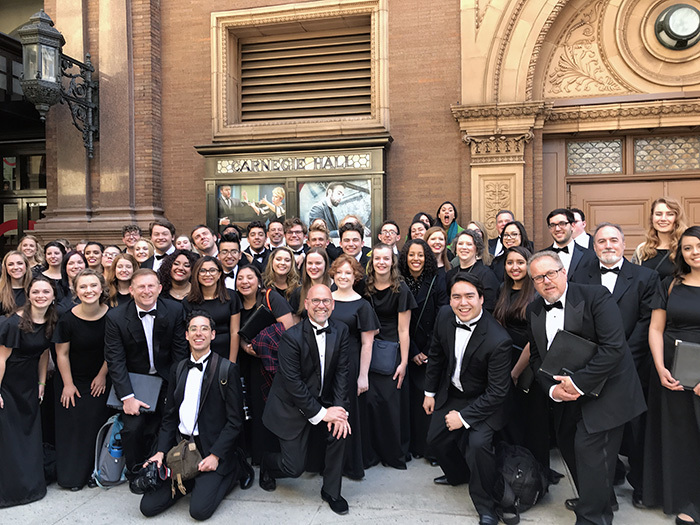 More than 50 Canyon Choral Society vocalists performed this week at the famed Carnegie Hall. Get on the plane. Rehearse, rehearse, rehearse. Perform at Carnegie Hall. Get back on the plane. Rehearse, rehearse, rehearse. Get ready to perform at Grand Canyon University commencement – eight times at eight ceremonies. That’s the modus operandi these days for Dr. Juan De Dios Hernandez, Assistant Dean of GCU’s College of Fine Arts and Production, and the 50-plus GCU vocalists with the Canyon Choral Society, the University’s community choir. “There’s no day off,” Hernandez said with a smile Wednesday morning, just two days after a game-changing concert at New York’s famed Carnegie Hall, just a few hours after deboarding the plane from New York to Phoenix, and just an hour or so before rehearsals at GCU Arena for a University record number of commencement ceremonies Thursday to Saturday. The choir spent a year raising funds for the historic concert at Carnegie Hall with the New England Symphonic Ensemble. It was the first time GCU’s vocalists performed at the famed venue. 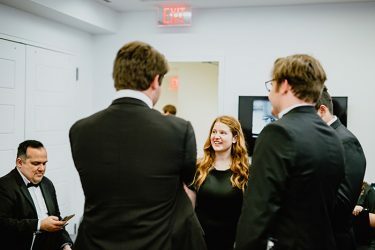 They spent months rehearsing their performance piece – Morten Lauridsen’s “Lux Aeterna,” or “Eternal Light,” a daunting, almost 30-minute choral work. 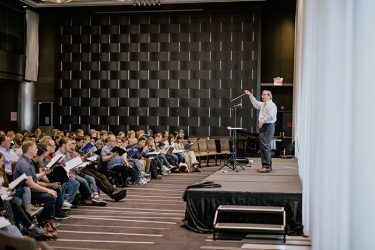 Dr. Juan De Dios Hernandez conducts the choir at a Carnegie Hall rehearsal. One of those students was Brad Duchene, a senior vocal performance major who not only will sing at the multiple commencement ceremonies over the next three days as a member of Critical Mass, he also will graduate during the first ceremony. The Carnegie Hall concert meant something more to him personally, he said, than it might have if things had worked out differently. The promise of Carnegie Hall loomed before him back in high school. Landes was particularly proud of how the choir sounded. “When you first look at this piece of music (Lauridsen’s “Lux Aeterna”), it looks very simple,” she said. “But it’s exceptionally difficult. The main struggle is that most of it is done without any instruments, so you’re very exposed (as a vocalist). Those mistakes will be amplified in Carnegie Hall. 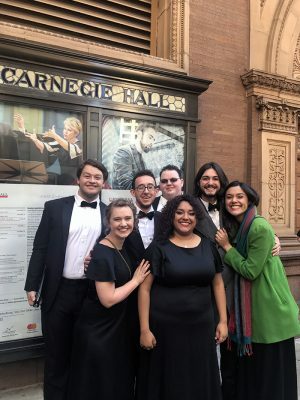 Emily Hendricks, a junior music education major, said she didn’t have the same reaction initially as some of her fellow choir members when first stepping into Carnegie Hall since she plans to be an educator first rather than a performer. The choir left Phoenix on April 20, then launched into rehearsals over the next three days before its 1 p.m. April 23 performance. The choir was one of about five to join the New England Symphonic Ensemble at the concert. Hernandez estimates about a couple thousand people watched them. “The audience seemed to enjoy our performance in particular. They were very appreciative,” he said. Not that the choir didn’t have time to step outside the hall during their trip to New York. During their down time, many of the choir’s vocalists caught a Broadway show or two, visited the National September 11 Memorial and Museum, or saw the other sites. “The hotel was half a block from the center of Times Square,” Duchene said. Of course, since returning from that once-in-a-lifetime trip, things haven’t slowed down for the choir. “We just had our sound check,” Landes said Wednesday afternoon after Critical Mass prepared for commencement. Duchene will be wearing his cap and gown at the 9 a.m. ceremony Thursday instead of his usual Critical Mass attire – doing double duty and likely thinking how the show must go on despite the sugar plums still dancing in his head after that Carnegie Hall appearance. You can reach GCU senior writer Lana Sweeten-Shults by email at lana.sweeten-shults@gcu.edu or by phone at 601-639-7901.